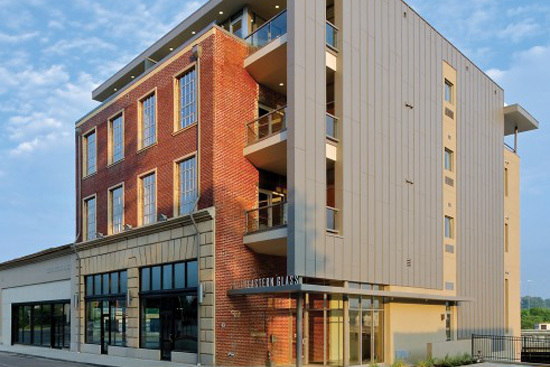 The Southeastern Glass Building is a mixed-use development in Knoxville, Tennessee. Designed by Sanders Pace Architecture the project is situated at a gateway intersection into downtown within a unique flat iron shaped historic building. Follow the break for drawings, photographs, and further project description. The original use of the building included a large vehicular elevator accessing all floors for the installation of automobile windshields and glass. This large vertical shaft yielded an extremely inefficient existing floor plate, while 50% of the existing square footage occurred below the street level. The design of the project rectifies these inefficiencies by locating a new vertical circulation core within an addition directly adjacent to the existing building along with much needed occupiable square footage within a new penthouse level. This new circulation core allows for the reclamation of the floor area previously occupied by the existing elevator and gives it over the new residential and retail spaces. These additions are separated both in plan and in section with a ribbon of glass and framed within a folded plane providing a clear distinction of the new program while celebrating the existing building’s historic qualities. A total of 15 unique residential units were created within a much more efficient floor plate utilizing new modern finishes to again contrast and showcase the existing massive existing structural elements of the original building. The four retail spaces have direct access from the main public pedestrian path, providing much needed activity to the district. Private parking under the building and newly created outdoor space for the residents gives this urban mixed use development much of the conveniences rarely found in a center city development.